The 90mm Easy-Clean High Tank Overflow Kit (TATO31) comes with 90mm outlet and 90 degree elbow, gasket, an slide out mosquito-proof screen for easy cleaning and stainless steel screws. The curved 90 degree bend is turned upward inside your tank, increasing your tank's harvesting capacity to 10cm higher than a standard overflow. Everything you need is in the box to help make installation a breeze. 90mm high tank overflow, stainless steel mosquito-proof screen, rubber gasket, stainless steel screws. 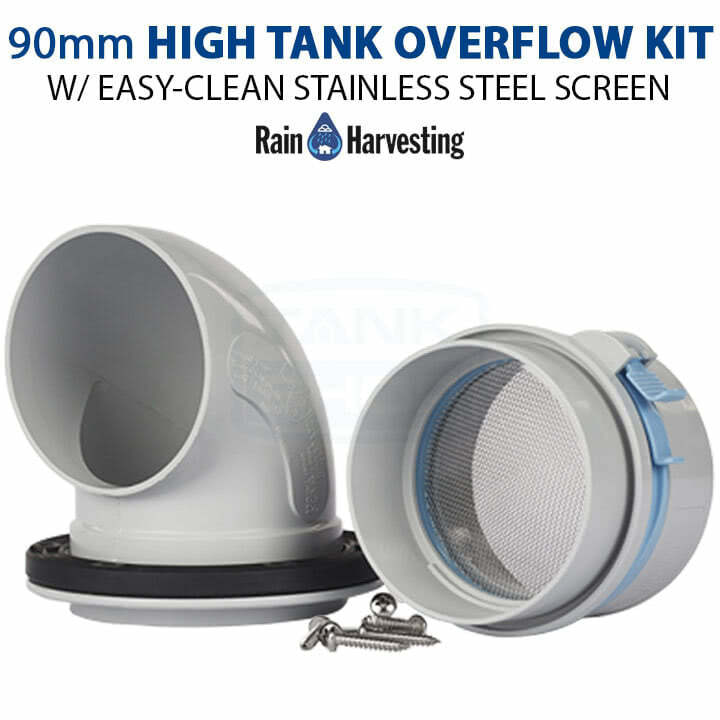 The 90mm Easy-Clean High Tank Overflow Kit (TATO31) comes with 90mm outlet and 90 degree elbow, gasket, an slide out mosquito-proof screen for easy cleaning and stainless steel screws. The curved 90 degree bend is turned upward inside your tank, increasing your tank’s harvesting capacity to 10cm higher than a standard overflow. Everything you need is in the box to help make installation a breeze. The mosquito-proof 955 micron stainless steel mesh protects the quality of your rainwater by keeping mosquitoes and other insects and animals out of your tanks. This also keeps you compliant in areas where mosquito-proofing is required by law.